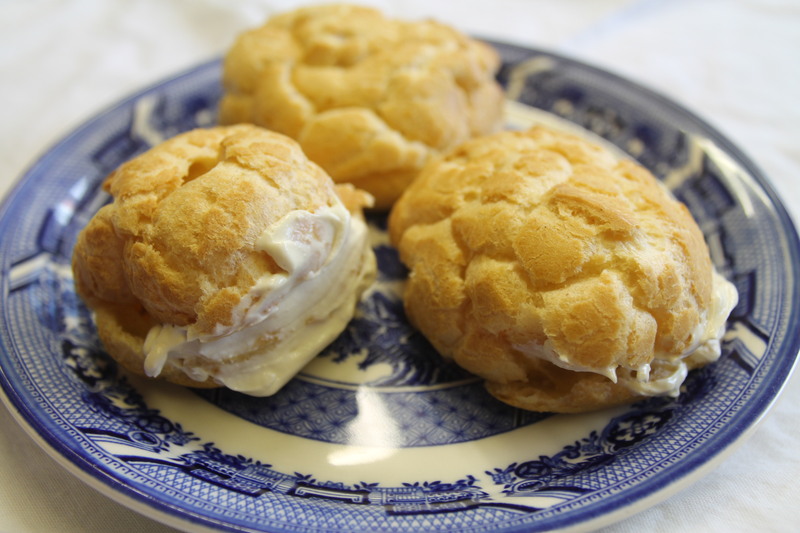 Cream cheese puffs are made from Choux pastry, which we made last year when we did the chocolate eclairs. Oven needs to be hot 220 C, 425 F Gas Mark 7 with a tray of water in the bottom. Two greased baking sheets run under water just before putting the puffs on. Melt the butter and water over a gentle heat then bring to the boil, then remove from heat and stir in the flour. Return to the heat and stirring all the time mix together until the mixture forms a ball in the middle of the pan. Allow to cool then add the lightly beaten eggs and beat together. Add the grated cheese and mix together well. Spoon the mixture, about 18, onto the baking sheets and bake for 10-15 minutes until risen and crisp outside. Make little slits into the sides and leave to cool. Mix all the filling ingredients together and chill until firm. Pipe the mixture into the buns using a plain nozzle.